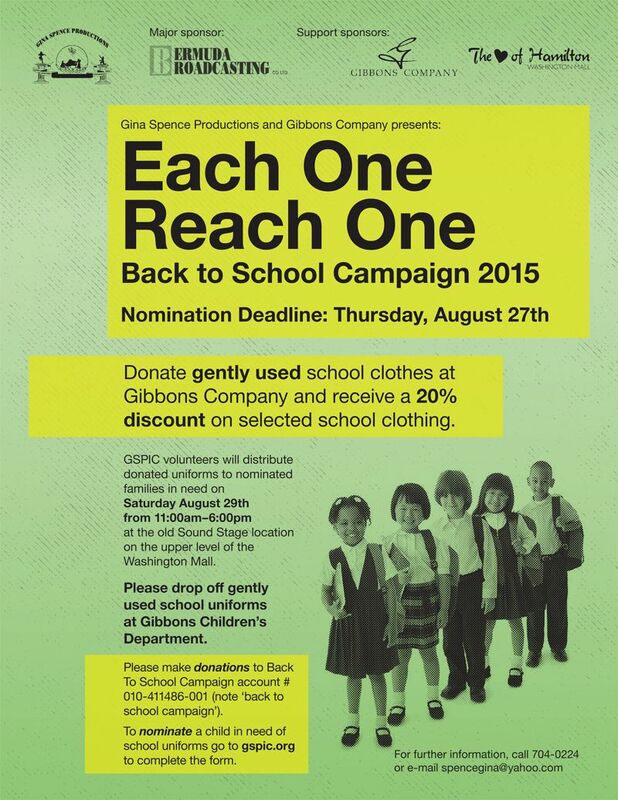 Gina Spence Productions are partnering with Gibbons Company once again for their uniform recycle program within their store. People who donate “gently used” school clothes will get a 20% discount on selected school items that are purchased. Gibbons will have collection bins throughout their children’s department and will collect the recycled uniforms. A spokesperson said, “GSPIC volunteers will distribute them to “families in need” on Saturday August 29th 2015 from 11:00am – 6:00 pm [at the old Sound Stage location on the upper level of the Washington Mall]. This space is being donated by Washington Properties. “We will continue do our “each one reach one” back to school drive in addition to giving out the gently used clothing received from Gibbons Company. “We are asking people to make donations to Back To School Campaign account # 010-411486-001 [note back to school campaign] and/or to nominate a child in need of school uniforms go online to gspic.org and or go to Gibbons children’s department to complete the form. Deadline for nominations is Thursday, August 27th. “Last year, we had a waiting list of families needing help with school uniforms; due to lost of jobs and the economy, we believe those numbers are going to increase. We received over 800 school clothing items and assisted other charities and families island wide. “With the Gibbons partnership and recycle program we are hoping to help more families in need. “We look forward to partnering with the Bermuda community once again to provide much needed help and support to our children and families. You can contact Gina Spence on 704-0224 or spencegina@yahoo.com. To nominate a child online go to http://gspic.org or go to Gibbons children’s department to complete the form [PDF here].